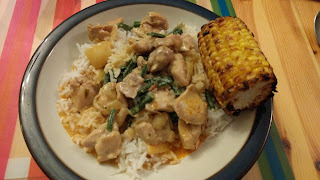 Regular readers will have realised I love anything that's sort of creamy chicken with rice. As a Bengali, I adore rice, and I find a creamy sauce stirred in with rice is a wonderfully comforting and soothing element of a meal. As I'm working outside the home now, I like meals which I can put together quickly in that short gap of time when the kids are taking a bit of downtime after school, or something I can put on and leave for a bit while I keep and eye on them, and make sure all is well. 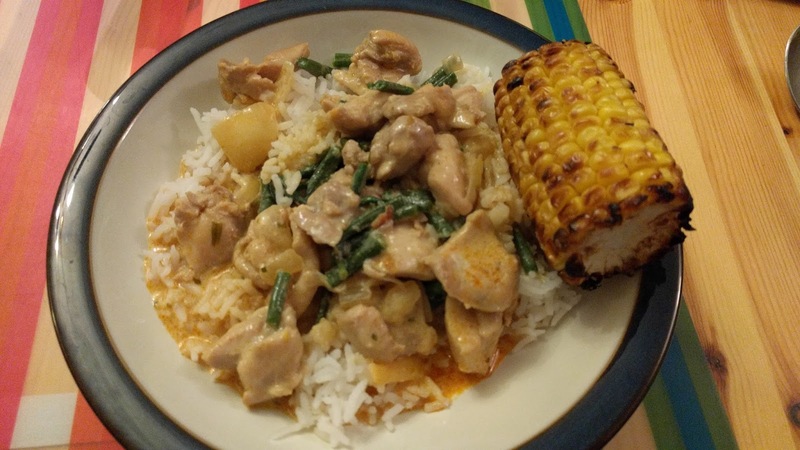 This paprika chicken is a bit of both and definitely good for the increasingly chilly evenings. a handful or 2 of some green veg - I used green beans which were left over from the meal the dinner before. rice and another veg to serve. Heat the oil in a saucepan or saute pan and then gently fry the onion and garlic. While that is softening, cut the chicken thighs into bite-size pieces, and then add them to the pan. Stir to prevent the onions and garlic from catching, and cook until the chicken is browned and not raw any longer. Now add the tarragon, ground cumin and paprika, and stir through. Next, add the Marigold powder and half a cup of boiling water. If the handful or 2 of green veg you are adding is raw, add it now too. Now cover the pan and allow to simmer. At this point, I cook the rice (in the microwave, or in my rice cooker, or the old-fashioned way - in a saucepan!) and also prepare the side vegetable. On this occasion, I grilled some corn cobbettes. Once the rice and vegetables are done, the chicken should also be cooked through, so switch off the heat and then add the small amount of green vegetables if they are already cooked as mine were. Finally, stir through your generous dollops of soured cream and serve with the rice and side vegetables.